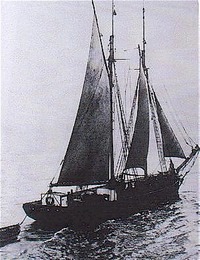 This photograph is of the "GOLDSEEKER" built by William Henry Qualtrough’s father, William, who was a prosperous shipbuilder in Douglas in the 1800s. William Henry’s parents had married in Geelong, Victoria, Australia where his father had gone (to seek gold in the goldfields, perhaps!). Eleanor Gawne had gone to Australia with her father and it was in Geelong that William and Eleanor had met, married and had their eldest daughter, Isabella, (William Henry’s eldest sister) in 1856. William and Eleanor returned to the Isle of Man to live in Douglas and have and bring up their family. William became a prosperous shipbuilder, building many vessels including the "Goldseeker" which it is said he sailed out to Australia and returned again to the Isle of Man. William Henry must have grown up in a busy family household with his brothers and sisters and he learnt his future trade of joiner/carpenter in light of his father’s example, although he appears not to have followed him into shipbuilding. 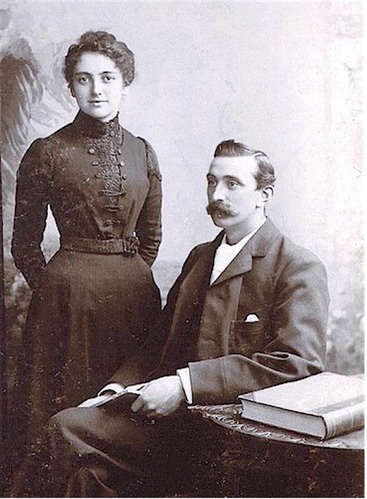 William Henry met and later married Isabella Johnson at St Barnabas Church, Douglas on 11 June 1901. William was 27 years old and Isabella 25 years old. Isabella’s father Robert Johnson was a printer/compositor by trade. William Henry and Isabella had one child, a son they called William Robert, born at Albany Road, Conchan (Onchan) Isle of Man on 9 June 1902. There eyes were on the future opportunities for their son. prior to emigrating to Winnipeg, Canada. The wave of emigration that occurred in Canada in the early 1900s probably inspired William Henry Qualtrough and his wife Isabella to take their son and seek a new life in Western Canada. The Canadian Government was advertising in Great Britain and Europe for "skilled workers and farm labourers" to come to Canada. Thus begins a new challenge for this Manx couple and their son in Winnipeg, Manitoba, Canada. Young William Robert (Bob) was apparently walking at the time they emigrated. The first address in Winnipeg upon their arrival was 553 Balmoral Street, Winnipeg and the next location was 198 Spence Street - both homes being a short distance to "Portage and Main" reputed to be the windiest and coldest intersection in Canada. William Henry was a "joiner/carpenter" on the Isle of Man and was to become a Master Carpenter for the T Eaton Company of Canada (Canada’s largest retail chain of stores) until his retirement. One of his duties was to build the "floats" for Winnipeg’s Annual Christmas Parade. During World War II he was awarded a special Quarter Century Gold Pocket Watch for his 25 years of service with Eatons and he continued working for several years after the war and then retired. Documents show this Qualtrough family living at the 553 Balmoral Street address in Winnipeg on 26 May 1924, and then living at 198 Spencer Street, which was their final residence. This home is well remembered by all the grandchildren. It was a three storey home where all the outstanding woodworking skills of William Henry is evident (even to this date). Beautiful hardwood floors, stair railings - all done by the Manxman - the son of William Qualtrough builder of the "Goldseeker". (See photograph above). Around this large home was a lawn and garden, well cared for by William Henry and, in time, tended by each of the grandsons as they came of age. William James (Bill), Terry and Harry each did their bit, although Grandma Isabella always said that Harry did it best. Son of William Henry and Isabella Qualtrough, William Robert (Bob),married Gladys Donalda Mason and they had six children - Beryl Anna (deceased), William James (Bill), Isabella Catherine Donalda (deceased), Terrence (Terry) (deceased), Harry Alan Mason, and Barbara Anne. Isabella was a very skilled knitter and created very fine pictures of petit-point. They took in "roomers" (boarders) and one especially remembered was Miss House, a nurse, who was affectionately known as "Housie". A frequent visitor to their house was Isabella’s brother, Frank Johnson who had been one of the signing witnesses of the marriage of Isabella and William Henry in 1901. He had also emigrated to Winnipeg, Canada. Frank was a N.C.O. in the Intelligence Corps. and a Dispatch Rider (motorcycle) in WW I. He was also known for his works of art, especially black pen and ink sketches. William Henry and Isabella spent many happy summer holidays at Kenora, Ontario, which borders Manitoba on the East. It was a train ride then and a car trip now. The family was also very active in the Manx Society in Winnipeg and there were many familiar names such as: Quail, Quirk, Quiggin, Cregeen, etc. The two major events were the Summer picnic and the Manx Christmas Tree Party, both of which were well attended. Much of their social life was centred around the Manx Society where they had many friends who had come from the Isle of Man. Each "Tynwald Day" the flag of the Isle of Man was raised on the "Winnipeg Free Press" building in downtown Winnipeg. Much to the delight of his grandchildren Grandpa William Henry Qualtrough often demonstrated his skill in speaking the Manx language to his grandchildren who remember those many happy family gatherings at 198 Spence Street. The atmosphere was scented with the rich aroma of a pipe filled with "Old Chum" tobacco and smoked by Grandpa William Henry. Here was a little bit of Manx cultural pride being shown to the children. Bill (William Henry’s eldest grandson) and Lola Qualtrough looked longingly at the fence of this beautiful home as it still existed in Winnipeg in 1998 and a kind young girl who lived there came and asked if she could help us... of course we explained our curiosity and she invited us to come in. The house is now being used as a Student Residence (near the University). There was all of Grandpa’s woodworking skills gleaming in the hardwood floors and stair railing. What a wonderful use of this home and obviously enjoyed by the students. Grandma Isabella would be happy to know that their home is still being used by "roomers". William Henry Qualtrough died 3 August 1961 at his home at 198 Spence Street and is buried in Elmwood Cemetery, Winnipeg, Manitoba. His wife, Isabella (nee Johnson) died in a Winnipeg Nursing Home on 15 October 1962 and is buried beside him. Compiled by Bill & Lola Qualtrough, Scarborough, Ontario, Canada.